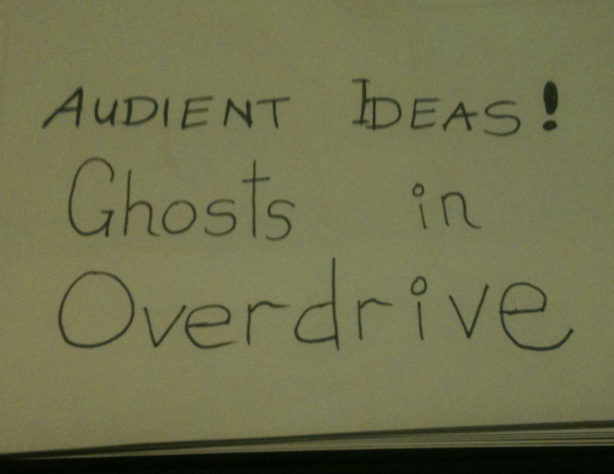 Audient Ideas: Ghosts In Overdrive! To fill the void left by Space Ghost’s passing, a team of Vigilantes is formed to combat Space Crime & avenge Space Ghost’s death. Using the strange and barely-controllable powers given to them by the same incident which cause the crash of their experimental spacecraft, the crew must rescue themselves without making things any worse. The psychological testing to ensure that only the right people get to wear ultra-tech watches granting them superpowers is very thorough, and never fails. So how is it that people are dying in a manner which points the big hand of blame squarely at a wearer of the intangibility-granting Ghost Watch? Once superpowers are discovered, and the ability to confer them on those with the potential is developed, the ‘Overdrivers’ have to decide between the approaches to the situation; Governmental? Private research? Or maybe Overdrive-enhanced extra-legal shenanigans? At sea, the Ghost Watch is that watch period in the middle of the night when spirits are most likely to be active, and when the summonings of the enemy’s Necromancers will strike. What happens when a media franchise goes on for so long that it becomes sentient, and starts to act in it’s own interest via the actors? Going back into the dungeon you’ve just looted to rescue that one guy who hit his head on the way out, and is still trapped backed there. Raumpatrouille Orion – A description of the show and it’s creation. Longitude (TV) and Sir Kenelm Digby, played by Stephen Fry, giving a much better description of the use of the “Powder of Sympathy”. I listen to my podcasts in fits and starts, so I’m just getting to this one. I’m actually reacting to your remarks comparing yourselves (to your disadvantage) to the RPG Design Panelcast. I would like to take a moment to dispute that there is anything inferior or shoddy in what y’all are putting out. I know you’ve been joking around about being a bunch of hacks since the beginning, but this is the first time it sounded like you are maybe starting to really believe it. Big Red Couch does something very creative that I have not seen anyone else do, and you do it very well. In the field of fiction writing, the question “Where do you get your ideas?” is infamous and often mocked. Aspiring writers who dare to ask it are informed, sometimes snootily, that finding ideas is the easy part. The thing is, it’s not so much inherently easy as it’s something that creative people get so used to that they forget about the time when they didn’t know how to do it themselves. Even if you did nothing but model the process of coming up with ideas, this podcast would be a worthwhile resource to any creative person, whether they were interested in RPGs or not. In fact, you do more than just model coming up with ideas. You also analyze those ideas in a way that steps firmly into a realm that no true creative person could dismiss as “the easy part.” You explore possible variations. You explore consequences. You look for difficulties in execution. I will grant that you don’t push through the whole process of making one of these ideas ready to hit the table. That’s fine. There are lots of people out there dispensing advice on that part of the creative process. None of the advice they give will be of any use to someone who can’t get through the steps you illustrate first. Sorry if this sounds a bit fanboyish, but when you start to sell yourselves short for real instead of in jest, I worry a little. Firstly, thank you; Thank you for listening, thank you for liking the show, and especially thank you for writing in to defend it against … its creators. You’ve raised some good points in favour of the show, at least one of which (“Where do you get your ideas”) I’d forgotten, or possibly never realised in the first place. The gamer sense of humour is perhaps a little self-depreciating, and the New Zealand sense of humour is REALLY self-depreciating (and sometime depreciating of others too, but that’s a different problem), and at the point at which a fan of the show is writing in to reassure us, I think it’s safe to say that we need to take it down a notch. For the record, and off the microphones, I’m actually pretty proud of the Big Red Couch. More by luck than judgement, we’ve found our odd little niche in the world of gaming, and I’m always flattered and slightly amazed when people find what we do to be worth listening to.